Mayor Filner was expected to return to work Monday after several weeks away for what his staff described as therapy and personal time. NBC 7 News has learned the mayor was meeting with attorney Gloria Allred, City Council President Todd Gloria, City Councilmember Kevin Faulconer at a location near City Hall. While the subject of the meeting was not revealed, it's expected to last much of the day. Dozens of San Diegans stood up for San Diego Mayor Bob Filner Monday, speaking on behalf of a man they hailed as a leader and supporter of civil rights, veterans and environmental issues. 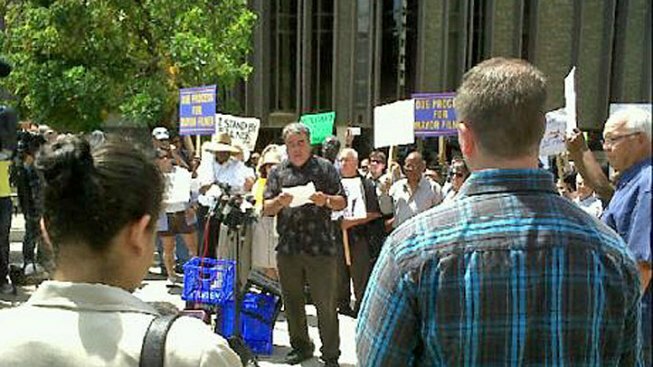 The Facebook group "San Diegans for Mayor Bob Filner," held a rally welcoming the mayor back to City Hall. Filner, 70, faces a recall effort, a sexual harassment lawsuit filed by a former employee and investigations by federal and local authorities on allegations ranging from unwanted sexual advances to “pay to play” schemes. The entire San Diego City Council has demanded he resign. The City Attorney claims his investigators have found that Filner has misused city funds which could lead to his removal of office under a rarely-used section of the City Charter. “Let’s get back to business of moving the region forward with Mayor Bob Filner,” said organizer and human activist Enrique Morones. One of the speakers addressed the allegations of inappropriate behavior directly. Community activist David Valladolid spoke of Filner's work with veterans groups. “He’s brought all of us into the process to be active in the city San Diego for the future direction the city will take and that threatens a lot of people,” said Valladolid. Former campaign volunteer Kathleen Harmon questioned the motivation behind the recall effort. She was followed by a series of women who all demanded due process for the mayor. “It’s time for the city to move forward and allow our legally-elected mayor to resume his position in city government,” said Suzie Ditmars, lifelong Democrat and local activist. Anita Hill was irate over what she considers the “flagrant disregard for the Constitutional rights of Mayor Bob Filner.” Hill made comparisons between the current political atmosphere in San Diego and the McCarthy era of the 1950s. “I still support Bob Filner and I trust Bob Filner to run our city in a Democratic, sustainable, environmentally sustainable way,” said Helen Bournes with the Women’s International League of Peace and Freedom. On Sunday, the recall effort officially kicked off with volunteers collected signatures in Balboa Park and Mission Valley. Recall organizers have until Sept. 26 to collect and turn in more than 101,000 valid signatures to qualify for the ballot. Attorney Bryan Pease spoke Monday about his concern over City Attorney Jan Goldsmith’s plan to use a section of the City Charter to remove Filner from office. “Nobody’s perfect. Bob has taken responsibility for his actions and I think he should be given credit for that,” Pease said. Mayor Filner released a statement one week ago in response to the recall effort that gave his constituents the impression he was not considering resignation but instead was looking forward to finishing out his term.